Public libraries have embraced some interesting ideas of late. Seed lending. 3-D printers. Kittens. Sometimes, it seems that we’re so eager to be trendsetters that we end up adjacent to a bullseye only five times out of a hundred. As a result, we … well … we waste a lot of bullets. And those are expensive. We do it because we want to be “relevant,” but nobody in or out of the industry seems to know what that means. 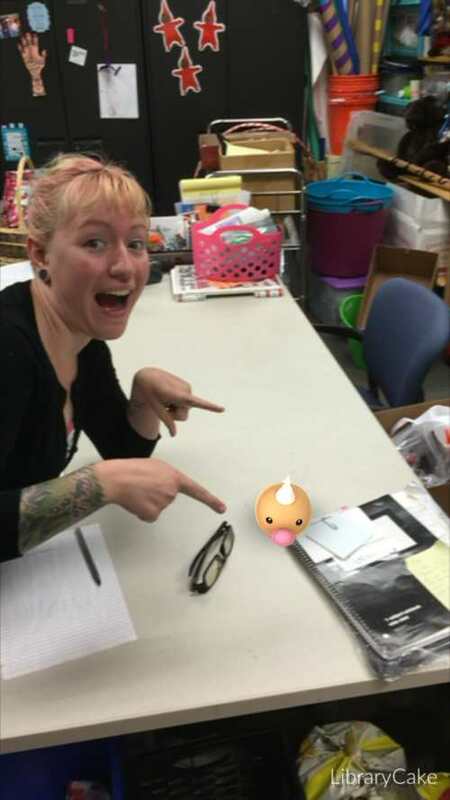 Librarian Ashley Brown points out a weedle at the Nevins Memorial Library in Methuen, Massachusetts. And then, freaking Pokemon Go falls into our laps like an apple of gold directly from the hand of the Great Archivist in the Sky. There is no earthly reason that public libraries should not be dancing in the streets right now. I’m dancing in the street. (Seriously, I’m writing this on my phone. I’ve got skills.) 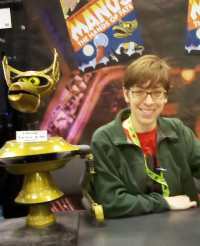 Outside of a massive across-the-board budget increase, this game is probably the best piece of luck we could have asked for. To begin with, Pokemon Go is going to ramp up foot traffic no matter what else libraries and librarians do. 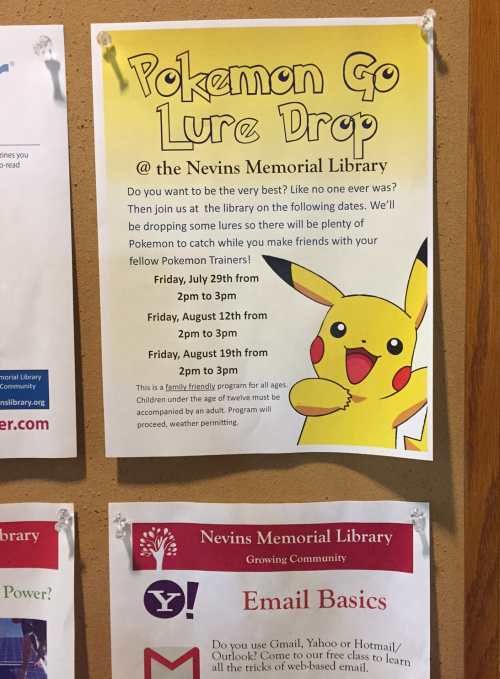 Most libraries are at least Pokestops, if not gyms, so people are going to show up simply to play. Watch your door counter and see if you don’t experience a jump in the next few weeks. 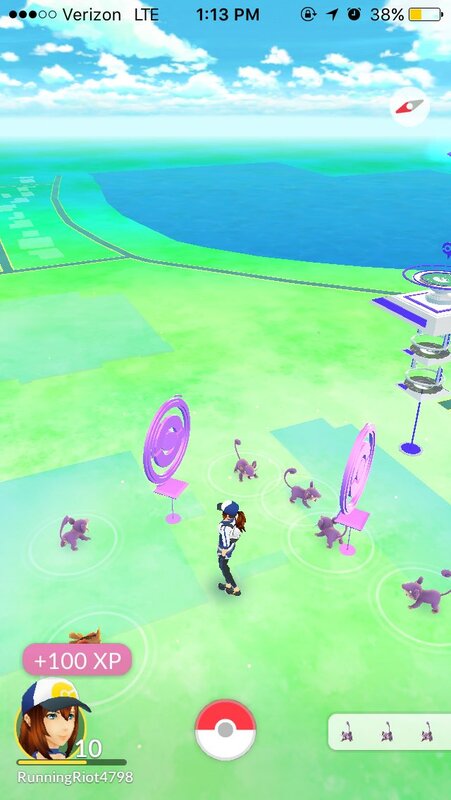 But the truly lovable thing about Go, from my perspective, is that it’s cheap as a horde of Ratatas. Compared to a 3-D printer’s $2,000-ish price tag, $100 for about 170 days of lures seems like a steal. But let’s say you don’t think it’s going to impact you. In these worrisome days of financial instability, you’re more concerned that the powers on high will slash your budget. My friend, look again at Pokemon. How long have libraries pushed uphill to fund services like free public water and free wifi, mostly to benefit politically disenfranchised impoverished and homeless patrons? Now those services benefit middle-class millennials who want to Be The Very Best. Thank Squirtle for the fact that a brand-new voter demographic is suddenly walking miles on end and looking for places to tank up. Suddenly, young people with money have reason to call their town administrator and demand to know why the library building is in such shoddy condition. Remember when libraries were useless book graveyards and were about to disappear because everyone could just get books on Amazon (lol)? I humbly invite the gentle contributors to the anti-library position to reopen the debate. You won’t want to interrupt your busy schedule of Tauros-training, so why not visit our open public facility, which happens to be a giant, air conditioned wifi hot spot? Which is also a gym. And has a lured Pokestop. And is open until 9 p.m. Now libraries can demonstrate, concretely and immediately, how very useful it is to have Internet access outside the home. Then, we can make a smaller, easier jump to the concept of public good. Imagine that, instead of Pokemon, you were looking for a job. Gotta get ’em all. To sum it all up, this game is already helping libraries without librarians even trying. It’s a gigantic Razz Berry just begging to be used on our rarest patrons. We’ve just got to grab it. 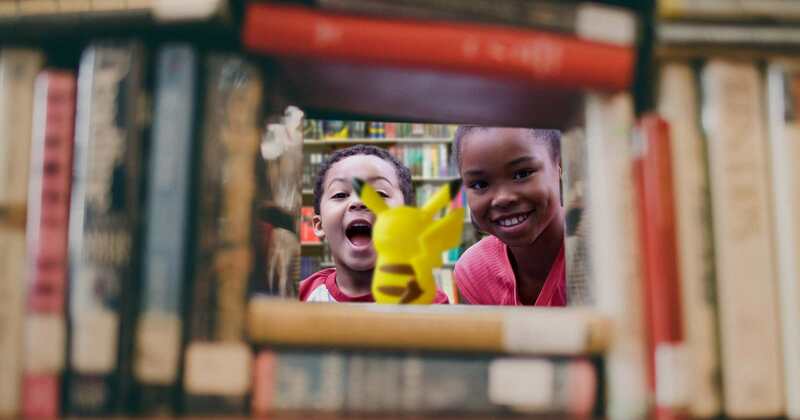 There are some direct ways that public (and academic) libraries can capitalize on Pokemon, of course, drawing people into the building and engaging them. Plenty of libraries are running programming, installing lures, and doing many rather creative things. There is a new librarian Facebook group, because of course there is, where the ideas are flying like Pokeballs at a pizza joint. But as public servants, the constant curse of the librarian is that we try too damn hard, and then we’re disappointed when people don’t respond as we’d hoped. That’s a recipe for burnout. For a phenomenon like this, which may very well give rise to copycats and imitators once its own hype dies down, we need to adapt systemically to take advantage of augmented reality (AR) in general without throwing in all our chips at once. People may physically enter the library looking not only for Pokemon (or zombies, or treasure, or whatever we’ll be running around hunting next,) but for a friendly and safe place to walk, snack, gather, and play. My point is this: we can adapt our spaces to all AR and benefit from what may become a big deal in gaming, and if it doesn’t happen, we’ve still leveraged this windfall to improve and update our spaces for modern priorities. And we’ve done it at minimum cost. First of all, if our spaces permit, we can lift librarywide noise restrictions. Yes, some patrons will complain. Yes, they will be taxpayers who pay your salary and yes, they will write letters to their congressman. You can have a quiet section just for those guys to go sit and glower. But librarywide silence is not conducive to socialization and it makes libraries look like the kind of places that wouldn’t welcome AR gamers. Or young kids, or study groups, or human beings, really. Then, there’s coffee, the provision of. You may have noticed that many Pokemon players like to hunt in packs in the evening after work or school. They’re not going to give up the chase for some stupid little thing like exhaustion! Aid them as they drive themselves to their physical limits in the pursuit of imaginary pocket monsters. You don’t need a cafe, just a carafe. Once players realize you’ve got cheap libations, word will spread. Students working twelve hour shifts on their midterm papers will appreciate it, too. This would also be a good place to put a water cooler and some cups. Whether you’ve got a full-fledged charging station, some random cords in a lost-and-found box, or just a few outlets, you can make a lot of friends by offering free power. You could even get a little bonus by placing a power bus next to the coffeepot and stocking the area with promotional material. In addition to Pokemon players, you’ll be supporting every middle school kid who currently bugs your staff to call their parents when the batteries in their phones die. Finally, just expect players to ask you about the in-house wifi. Know its details inside and out. How many people can be on the network at once? Is landline and wifi bandwidth combined under your contract? Does your wifi require a login? Be ready with answers. (And fixes.) Not only will this make you popular with patrons, but the rest of the staff will soon see you as a nearly oracular source of technology wisdom. And, by the way, do you play? You may just want to stack a Pokestop with a lure, or you may want to put a ton of promo material around the Pokestop and add a comments board, but the most minor of library Pokemon optimization is contingent on your actually knowing what’s going on. That means you’re going to have to download that app and play, you poor long-suffering person. You’ll have to have the app on your phone and ask your patrons what they’ve found and compete with your boss and rule your gym with your sick Flareon named Petunia. The things you do for your career.